The home of the Waterfront UTC is a specially constructed self-contained new build at the rapidly developing Chatham Waters regeneration site in north Gillingham. The £12 million building and fitting out costs were met by the Education Funding Agency, as an important part of the Government’s school reforms that are being made through the national University Technical College initiative that aim to make a vital contribution to raising education standards, as well as preparing young people for a career in technology. 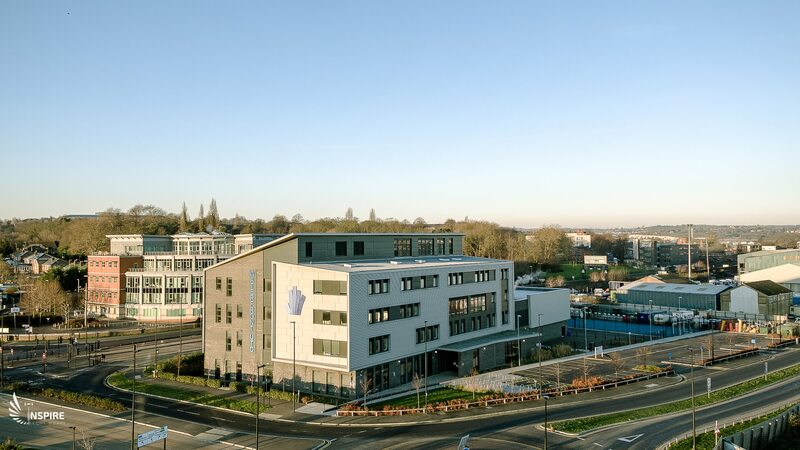 Full planning consent for the building was granted by Medway Council in July 2014.The lead build contractor, Bowmer and Kirkland, started on site in September 2014, with the building being complete in September 2015. The building is fully equipped with state of the art facilities to enable and enhance the ‘learning by doing’ approach to delivering the ‘engineering’ and ‘construction’ focus of the UTC. These facilities have been carefully developed in close collaboration with our employer sponsors. This approach is also exemplified by the internals of the facility itself, with them being particularly designed to be create a live learning laboratory to enable students to understand the construction and engineering, and operational features of a state of the art, environmentally friendly building. The internals of the building have also been designed to create a business-like environment, in keeping with the ethos and focus of the UTC. The building is fully ICT enabled to permit students to mirror industry practice, as well as enhancing their own learning. Waterfront UTC’s full capacity holds 600 students.